When you want to promote your latest console and its software, there's really no better way than to get a load of famous people to play it and take some photos of them. Nintendo adhered to this time-honoured strategy at this year's San Diego Comic-Con by gathering a bunch of TV stars on a yacht and forcing a Wii Remote into their hands. 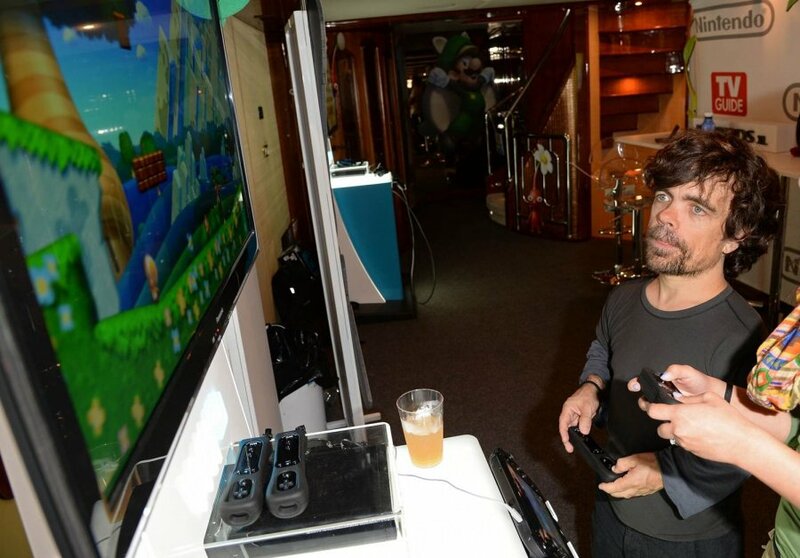 Peter Dinklage (Game of Thrones), Kevin Bacon (The Following and a load of Hollywood movies), Norman Reedus (The Walking Dead) and Scott Wilson (also The Walking Dead) were all caught playing Nintendo games, as the photographic evidence below proves beyond all reasonable doubt. 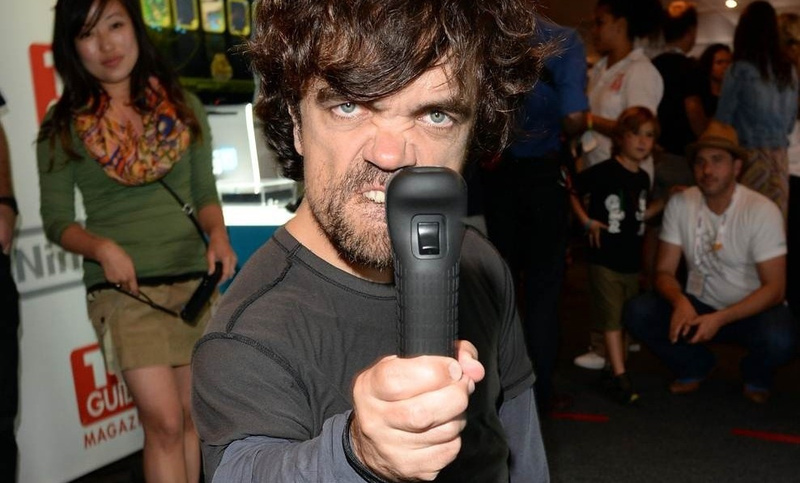 Hopefully the sight of some famous faces "off the television" will encourage fence-sitters to open up their wallets and buy a Wii U.
Peter Dinklage is an amazing actor. He is simply awesome on Game of Thrones. @Captain_Gonru Kevin Bacon is playing Super Mario Bros. Its just a bad angle of the tv but you can see a dim image of the title screen for the game. Kevin Bacon. The greatest actor to never even be nominated for an Academy Award. What do you have against Community, Damo?! So I guess we can all include Mario in that Six Degrees of Kevin Bacon game now, eh? Not really sure why this would get anyone to pick up a Wii U, they either have a sort of deer-in-the-headlights look, or else look like Mario requires some serious brainpower they don't quite possess. Not the best candids. A koopa always pays his debts. These actors don't looked satisfied, although I don't really think Nintendo "forced" them.. maybe a little bit of cash was involved. Peter Dinklage was incredibble in the station agent, great movie too. agreed! I loved the station agent. He's great n GoT's too. Good to see him enjoying a WiiU. I think Walking Dead (saw 5 minutes of an episode once, still haven't played Last of Us) and GoT (watched all 30 episodes last month) is the way to go. But only Kevin Bacon is holding a Gamepad. Seeing a bunch of bunch of tv stars holding Wiimotes isn't really helping. On a brighter note Gamestop had a demo for Game and Wario AND a Wiimote and nunchuck set-up. We'll be back. I want to meet a person that bases his decision to buy a Wii U on seeing famous people playing it. I'd poke him with a stick and see what his next big decision is. Oh and: Tyrion seems to have found a fitting sword! Never heard of them before. I dont watch their show ether. I am sure they did it for free, whon dosnt want to play a free round of a Nintendo game? Show me a picture of John Hodgman playing WiiU and I'll buy twelve. Actually... please don't show me that picture because that sounds really expensive. 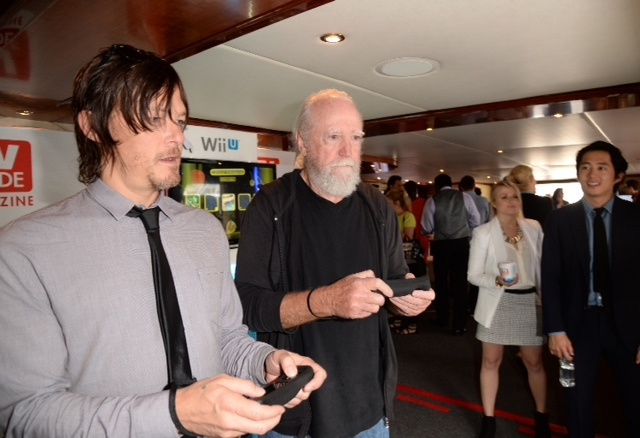 Hershel Greene (Scott Wilson) playing Nintendo. That's all kinds of sagely baddonkey right there. While playing, Hershel kept shouting at Norman to "Get back here!!" @Fazermint As crazy as it sounds, but it does work... Have you heard of the addiction called "Celebrity Worship" ? Its a big problem in 'Murica... People OBSESS about celebrities every move... they eat, drink, and sleep celebrities. What are they wearing, where are they going, who are they dating..... its insanity. These peoples lives revolve completely on celebrity gossip all day, every day. These are the type of people who see a celebrity doing something, and they instantly want to do that too. Its like their lives are so sad and pathetic, that they live vicariously through these celebrities, so they mimic them in their everyday lives.... Its basically worshipping. Why are Kim Kardash something or other famous? What has Paris Hilton created that people care about what she does every morning? @element187 It really is quite sickening. It gets on my nerves when people are incapable of thinking on their own and mindlessly adhere to external forces (religion, or fashion, for instance, or in this case celebrity lifestyle). Celebrities are seen as some kind of role models. Fact is, most of them are far from appropriate as role models, with their twisted ideals and priorities. @DkFluttershyGuy Nice! The evil queen. Still trying to learn Kevin's dance moves, but sadly the 80's are gone. May have been more appropriate for him to be playing just dance. Spare us your generic celebrity bashing. You lost all credibility when you lumped religion in with fashion. Why, because people are influenced by both? Let's just throw art and literature in there as well, those menacing "external forces." I happen to be an atheist, but that is an incredibly stupid statement. As for the photos, hell, I'll take any kind of marketing/publicity at this point. @Plutonian People do mindlessly adhere to both. Not all people, but way too many. Therefore it's a valid statement. @Plutonian It is not my fault you don't understand what I'm saying. Make sure you do before lashing out at people - it might be inappropriate. Thats awesome , i always wondered if i played any celebrities online !